Since it’s only about 40 minutes from our house, my friend Becky came down for a fiber weekend. Neither of us is really in stash acquisition mode at the moment, but we wanted to go check out the market. 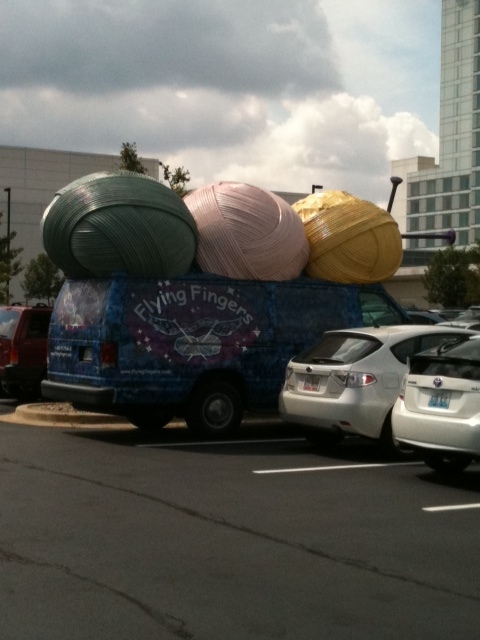 And so it happened that we spent about 5 hours on Saturday wandering through a convention center full of yarn. The market itself is all a bit of a blur. There was yarn. A lot of it. There was so much variety, that it was a little hard to take it all in. We walked the entire show before purchasing anything, which is just how I like to shop. It gives me time to just look at things without feeling tempted to buy, and then at the end I go back and buy the things that I really remember and that stuck out as unique or interesting in some way. It helps me cut down on the impulse purchases, and it guarantees that I don’t blow the budget on something I love and then go to the next booth just to find something that’s 10 times better. Honestly, I think it’s the only way I can make it through a market that big in one piece. This time, I had a focus for my browsing, too. While we were back in Boston last weekend, I asked my grandmother if she’d be willing to knit me a sweater for Christmas. She knits beautifully, and is always churning things out for charities, strangers, and just about anyone else that could use a knitted item, but she only knits on request. She knit me a small afghan a few years ago, but that’s the only knitted item I have from her. I was thrilled that she agreed, and she was thrilled to get a request, which just works out perfectly. So now I am in search of the perfect sweater. I had narrowed the choices down to two sweaters from Twist Collective: the Metro cardigan, and the Primrose path pullover. I went to the market looking for a yarn. It was a tough choice, but eventually I found it. I ended up with four skeins of Madeline Tosh Pashmina, in Rose. 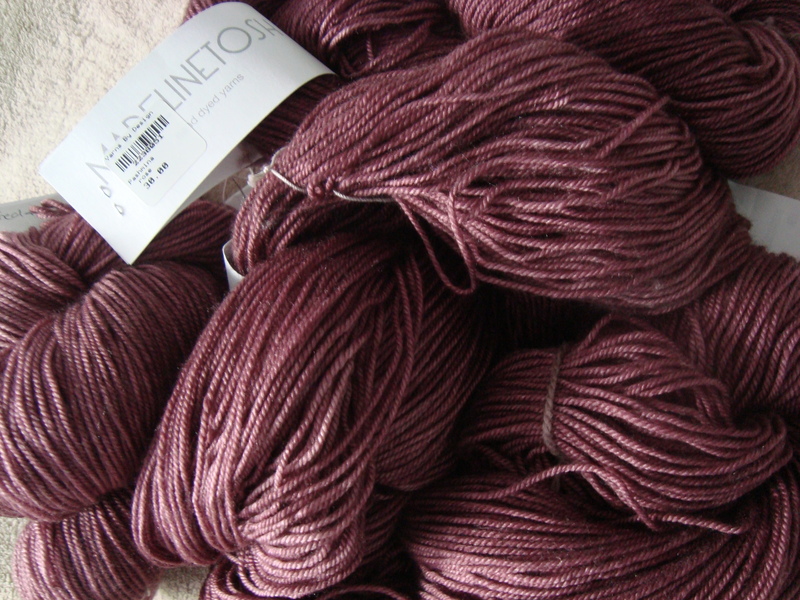 Next, I bought some laceweight alpaca silk from Just Our Yarns. I’ve had a skein of their tencel marinating in the stash for several years, and I’ve been dying to use it. Their booth was just full of beautiful woven scarves, and they were very generous with their time, chatting about the different weave structures and how they use color in their projects. We spent a long time there on the first pass through the market, and then went back to pick up some laceweight to make a woven scarf. This may just be the next project on the loom…I’m really excited to see how it comes out. Both Becky and I were surprised to find ourselves a little ambivalent about a lot of the yarn at the show. 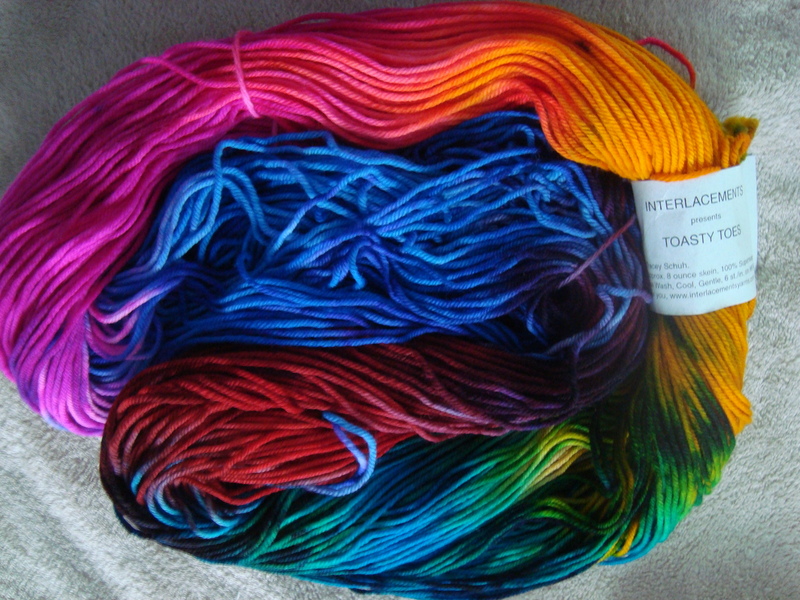 Part of it was probably the overwhelm factor, but part of it was also the fact that we can find a lot of these yarns in our local yarn shops, and we’d tend to want to support them instead, given the choice. There were a lot of resellers rather than indie dyers or company owners there. I guess that’s to be expected from a big show, but we were surprised to find ourselves resisting temptation rather well, considering the circumstances. There were so many beautiful things, but not too many that we absolutely had to have. It’s a skein of Toasty Toes from Interlacements. 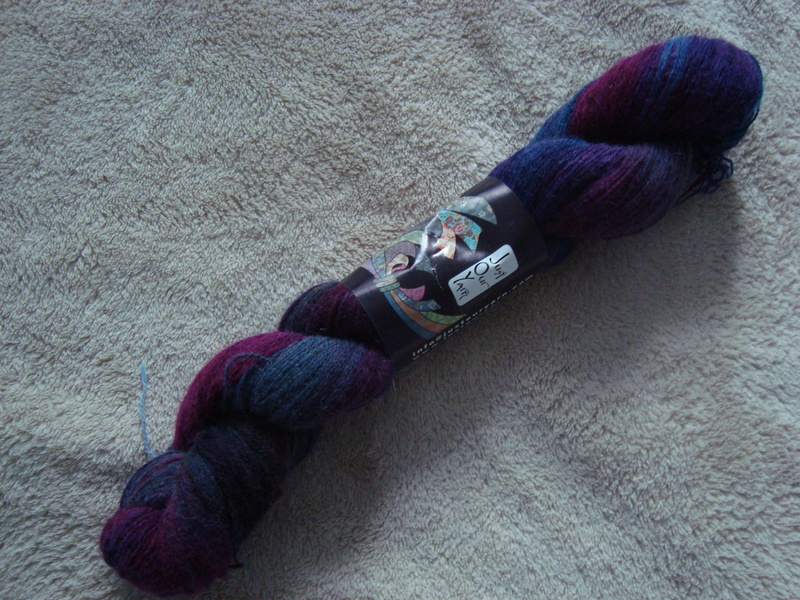 I’ve never heard of them before, but this skein called me over from a booth or two away. I keep saying that these are not really my colors (especially that pink), but this skein commanded that it must be bought, and that it must be knit. With black. I even broke my stash rule for this one: I have no idea what it will become. But it had to come home, and it will be knit up as some kind of highlight against a black background. I find that the colors I love most often take me by surprise. They’re things I don’t think of as “my” colors, but they stand out or create highlights in interesting ways that work with my usual color palette. And that palette has been getting bolder of late, moving away from only earth tones and into jewel and (apparently) even brighter shades. I don’t know yet what this will be. I’m frankly still a little shocked at the fact that it made its way home with me. But this skein has a mind of its own, and some very definite ideas of what it should become. I’m excited to find out what they might be. All those lovelies! The Madeleine Tosh will make a lovely sweater. It’s so nice that your grandma is willing to do that for you. I think my grandma would be willing if she dared to do big projects anymore, but she’s nervous to start anything because of her arthritis. I have other things from her, though, so I won’t complain. I like to review a whole market before I buy, too. Not that it necessarily preserves my budget, but it does save me from buying one yarn only to find I like another better. Pashmina – oh, that is good stuff. What a gift for your grandma to give it to her to knit! And I think I hear that brilliant skein calling clear from here! I can see why you felt strong armed by that bright skein. Had I been there, it definitely would have forced it’s way into my arms! And I agree with Ellen…that Pashmina will be wonderful knitting! OHHH, love the Toasty Toes!! DesigKnit is powered by	WordPress 4.8.9 . Page generated in 0.315 seconds using 38 queries.